Outdoor Heated Pet Shelter BUY Heated Pet Shelter, Cat Shelter, Dog Shelter, Heated Cat Shelter, Heated Dog Shelter, 82989, 84247, Heated Pet House. Outdoor Heated Pet Shelter is designed to provide outdoor shelter for small pets. 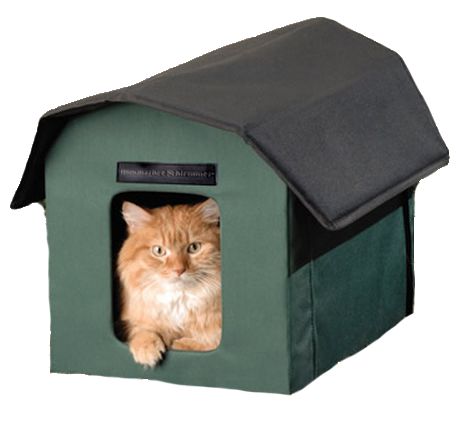 An integrated heater built into the floor of the Heated Pet Shelter keeps your cat or small dog warm and cozy. The Pet Shelter has a removable 20-watt heater beneath the shelter floor that generates radiant heat to warm the floor. Not hot to the human touch, the radiant heat of the Heated Pet Shelter keeps your cat or small dog comfortable on cool nights. The floor of the Outdoor Heated Pet Shelter is waterproof and lined with soft 1-1/2 inch foam to provide a soft, dry surface for sleeping. 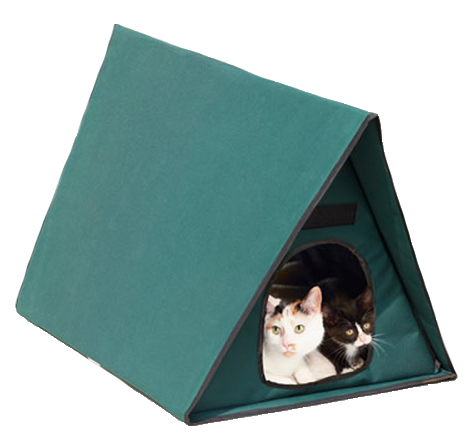 The exterior of the Outdoor Heated Pet Shelter is manufactured with 600-denier nylon fabric with a waterproof vinyl backing. The front and back entrance have plastic flaps to keep the elements out and the heat in. Your pet can easily enter or exit the Outdoor Heated Pet Shelter at will. Select between Gambrel Roof style or an A Frame Roof Style Pet Shelter to keep your dog or cat protected from the elements. The gambrel roof overhangs all four sides of the pet shelter, keeping rain out. 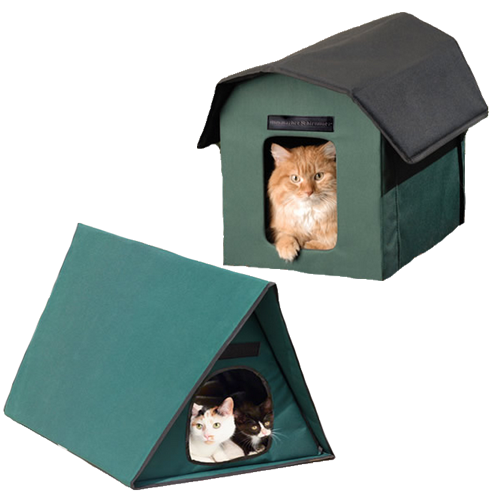 The larger A Frame style dog and cat shelter provides room for up to four cats or small dogs. Provides radiant heat for your pet. Provides shelter from rain and elements. Outdoor Heated Pet Shelters Product Numbers: 82989, 84247. 5-1/2 Foot AC Cord with Steel Wrapping. 600-denier nylon construction with vinyl backing. Great Dog House that is heated. These little dog/cat houses are great. Snuffy stays warm and cozy and a lot more content when the weather cools down. He will stay outdoors a lot longer now before whining to let him into the house.